VATICAN CITY, Mar 14, 2008 – The Holy Father’s third encyclical will discuss Catholic social teaching. ANSA reports that the encyclical will be titled “Caritas in Veritate,” “Love in Truth,” and it will build upon the previous encylicals Populorum Progressio by Pope Paul VI & Sollicitoud Rei by John Paul II. 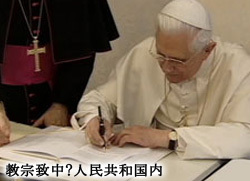 The four chapter encyclical will no longer be published on May 1st as previously planned due to the difficulties in translating the document into Chinese.